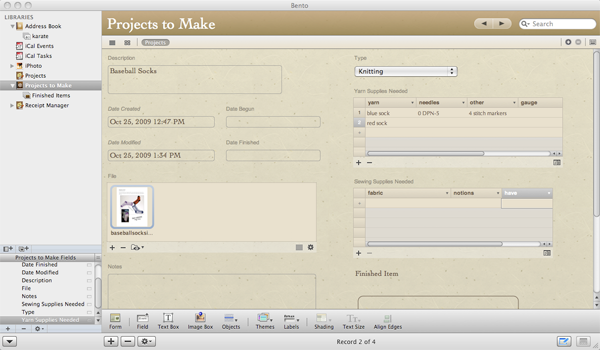 Bento 3 is the latest version of Filemaker’s database program for small businesses and home users. Among the newest features are iPhoto integration, grid view, password protection, and multi-user sharing. Each database in Bento 3 is called a Library. 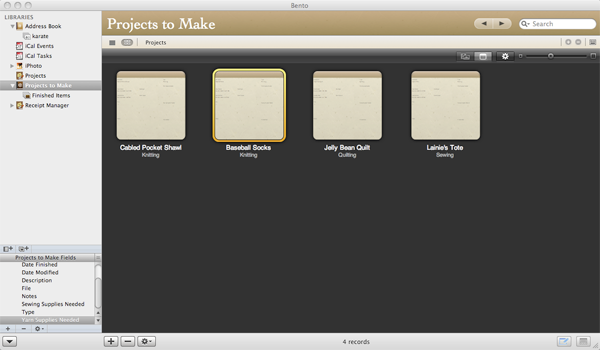 Libraries can be grouped into folders, similar to iPhoto and iTunes, for easier organization. The exception to this rule is that Address Book, iCal Events, iCal Tasks and iPhoto libraries cannot be moved into folders. Libraries can be further organized into Collections, which are records from a specific Library (think playlists in iTunes). You could create collections in your Address Book Library of friends, family, co-workers, book group members, and so on. As someone who’s only real experience with databases was a recent college class on Microsoft Access – sort of like being thrown to the wolves – how was working with Bento 3? I will admit that creating my first database did give me some problems. While it helps to be a little bit familiar with databases, it is definitely not a requirement with Bento 3. When I created the fields and dragged them to the main window, they wouldn’t let me arrange them the way I wanted. A little patience and a quick check with the Help file solved the problem – most of it was operator error. After launching Bento 3, the information from my Address Book, iCal and iPhoto libraries appeared in the left column. Data can be viewed in Table View, Grid View, Split View, but most of the time you’ll be in Form View. Arrows in the upper right corner let you scroll through your individual forms. The key thing to remember about Bento 3 is its ability to customize libraries to your specifications. A list of Fields (an individual piece of information, such as last name or phone number) is located in the lower left corner particular to the type of library you’re in. Some are already on the form; if you want to add another field listed, for example, Spouse’s Name, you would just drag it to the form and place it where you want it. If the Field you want isn’t listed there are three ways to create one: in the Menu bar click Insert–>New Field; enter Control N; or click the + sign below the list of existing Fields. Whichever way you choose, a box pops open that has you select a Field type (Text, Number, Choice, Checkbox, Media, Simple List, File List, Message List, Related Data), and then name that Field. Don’t worry if right now you don’t know what some of those Field types are – when you make a choice a text box appears describing that option. 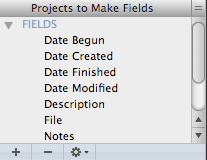 The newly created Field is added to the Fields List, which you then drag and drop onto your form. The amount of information you add to a form is limited only by your imagination. Bento 3 allows the user to customize the database to his/her personal needs. Add photos to your Address Book Library contacts and keep track of birthday’s/anniversaries/special occasions of everyone in the family; expand on your photo details in the iPhoto Library; link photos to databases; include very detailed data on your home inventory. The built-in templates are just a jumping off point; you can add and delete fields to suit your own needs. Did I mention how customizable Bento 3 is? It should be noted that any data that is added, changed or deleted in the Address Book, iCal Events and iCal Tasks Libraries is immediately reflected in the Address Book and iCal apps. This does not occur with iPhoto. One of the most requested features added to this version of Bento is sharing. Bento libraries can be shared with up to five people over a Local Area Network (LAN), but not over the Internet. Each computer must have a copy of Bento 3 installed. For additional security, databases can be password protected, and encryption can be used on fields within databases. Note: you do not have to be sharing databases to use encryption. Bento 3 comes with 35 templates to get users started, which include Expenses, Party Planning, Health Record, Wine Collection, and a Blank template to create your own unique Library. If these choices aren’t enough, Filemaker has a Bento Template Exchange, where Bento users share Templates they’ve created. You may download these templates, over 300 at the time of this writing, then customize them to your own needs. The Bento Template Exchange is accessible from the Bento Help menu. Since I’m a knitter/quilter, I have a folder of projects I’ve found online that I may want to make one day. Perfect to enter into a database. As you can see on the above graphic, the Projects To Make form I created has a place for me to note when each project is begun and finished, what supplies I need and how much, and a link to the pattern on my computer. When the project is completed, I can add notes and a picture. If I find this form has too much or too little information, I’ll add or delete fields. By syncing my Bento libraries to the Bento iPhone app ($4.99), I’ll always have my data at my fingertips. Once I got a feel for how Bento worked it felt more and more like a Mac program. It was fun to see what I kind of forms I could make, and how I could capture the data I wanted. I do wish, though, there was a greater variety of Themes and Library Icons, although these wishes are both very minor. 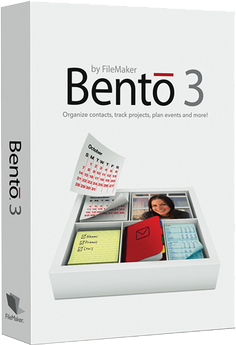 There are so many more features in Bento 3 that this review can only scratch the surface. The best way to learn, like with most software, is to play with the program. Look through the Help files and User’s Guide, watch the video tutorials, check out the Bento Forums. Bottom line – if you just want a simple database to keep your information organized, Bento 3 is for you. However, if you’re looking for something a little more robust, that will adapt to your needs, then Bento 3 is also for you. Bento isn’t a word processor, it’s for creating databases. That said, I’m sorry you’re having problems. Your best bet is contacting FileMaker? Here’s the link, good luck! I am having the same troubles as yadvinder: I created many libraries in Bento yesterday, and when I opened Bento today the file and text fields were blank. I lost all the work.